Pidato Tema Tahun Baru. Contoh naskah pidato ini cocok untuk saat ini karena menjelang Tahun Baru. Jadi bagi anda yang sedang mencari contoh pidato yang berbahasa inggris, di sini saya memberikan solusi buat anda. 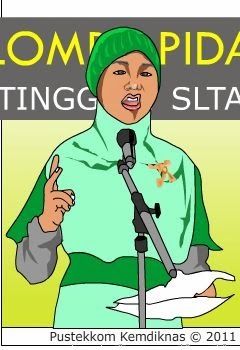 ini hanya sebagai bahan pembelajaran. jadi kalau bisa jangan di copy full ya. Assalamu'alaikum Wr. Wb. Hello all .. I told the gathering May we always be in the shelter of Him, Amen . First of all let us render thanks please re- think nearness of God the Almighty who gave all grace and blessings to all of us to face the obstacles of life that often make us one in this act . And I love all of my companions ..
Do not feel a year has passed , we have to leave in 2013 , and now we will move on to achieve new ambitions and new vigor in 2014 . Time continues to roll , and we will never return . So what lessons can we take from it? Surely, we should be able to make the most of as smart as possible for us to do things that positive nature , developing , rewarding , and useful for our lives . Let 's make this new year as momentum to look back what we have already achieved . What we have managed to do a lot of useful things for our lives , or just the opposite happened . Let's organize ourselves better to error and failure in the previous year will not be repeated this status by year . Using time with smart as possible is a responsibility for us all . Not for others , not for the sake of others , but for our own interests . Let's avoid to waste our free time , because the time we have to be constantly narrowed . Let's work with a vengeance to disillusion ourselves that the use of time as smart as possible is one of the most important keys to living life towards a better future . Meyia Never waste time we have , because tomorrow we will not have it anymore . Time will continue to run the bath water streams flowing, and a second water will dry out , and before we run out of water then we certainly need to use the water for things good and useful. Year after year continues to change . The time we have never more than today or yesterday , so let us take the time remaining to the activities of the noble , and not use it for things or useless activity . So that I can pass on this opportunity . Hopefully this new status by year we are more ready to contemplate a better future with our preparedness to use the time we have with smart as possible. So , hopefully today will be the beginning for all of us seeks to create a better life , Amen .